“System Alert! Add Extension” pop-up is the PUP that uses misleading techniques to prevent removal. Use Reimage to locate malicious components and get rid of them faster than with uninstall instructions. A full system scan blocks virus reappearance and prevents traffic to malicious domains. “System Alert! Add Extension” virus triggers fake alerts urging netizens to install shady extensions. Most likely, you may encounter them while getting redirected by a movie streaming site. The messages ask to install a browser extension in order to assure browsing safety. 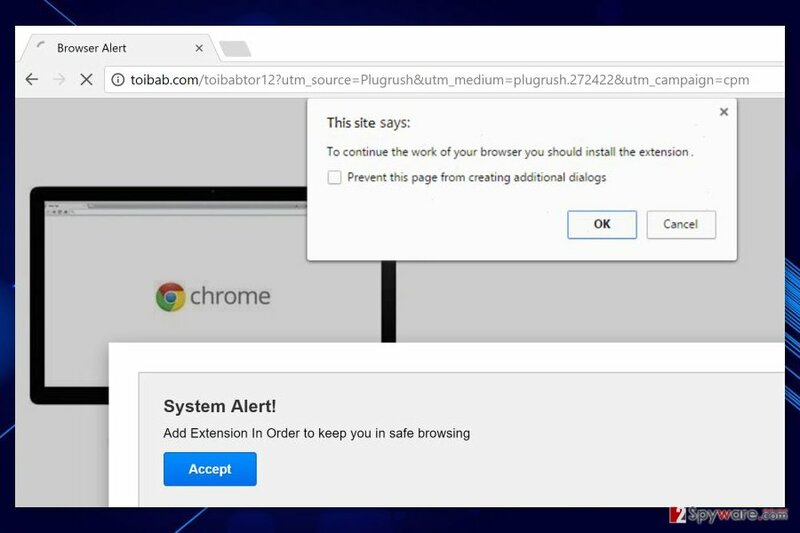 Enabling the installation this suspicious extension may lead to hijacked web browser, installation of an ad-supported application or even malicious program. “System Alert! Add Extension” might prevent from closing the misleading website. But you should not agree to install the offered extension, click “Cancel” button or mark “Prevent this page from creating additional dialogs” option. It’s a trick. You will be still forced to install the extension. In some cases, this notification is followed by a voice message that says: “Click Add button to install the extension.” No matter how convincing or threatening robot’s voice is, you should not do what you are asked. Once you end up on such website, close the browser’s tab. If you cannot do it, you should force-quit and then scan the computer with anti-malware/anti-spyware. The security program, such as Reimage, will help to remove “System Alert! Add Extension” and forget about other negative features of the adware. As we have mentioned, redirects to this malicious site are usually initiated by an ad-supported program. This potentially unwanted program (PUP) spread in software bundles and enters the system silently. Once it gets inside, it might alter few settings in Windows and web browsers. modify browser’s homepage or/and search engine. “System Alert! 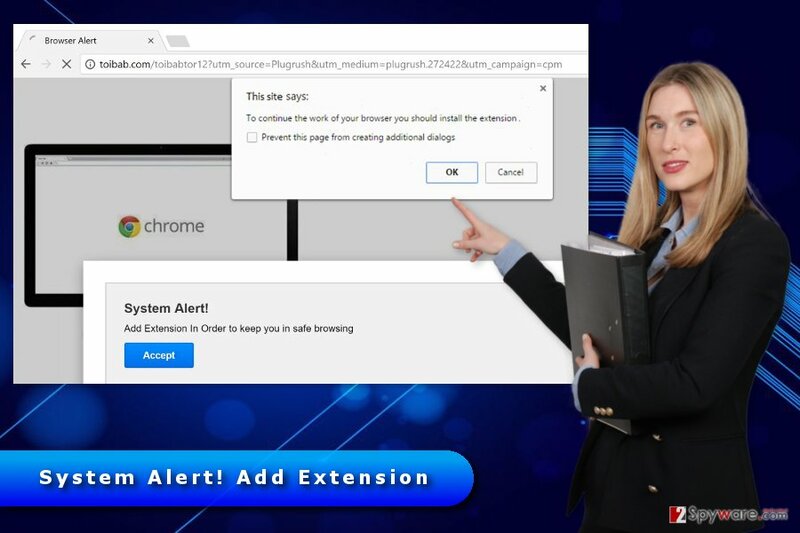 Add Extension” removal is also recommended because adware might deliver third-party ads that lead to infected, phishing or tech support scam websites. Thus, you can easily suffer from cyber criminals, reveal your personal information or let malware to your PC. Currently, the majority of users who have dealt with this cyber parasite the most are the United States, Canada, and the United Kingdom. However, it might spread further to other parts of the world too. “System Alert! Add Extension" is a fake notification that aggressively asks to install an unknown Chrome extension. When you’re browsing through adult-themed websites or watch movies on illegal video streaming sites, you might receive “System Alert! Add Extension” pop-up any minute. Obviously, you should not use such sites in order to protect yourself from similar cyber infections. However, redirects to the misleading site are most of the time caused by an adware program. If you have recently installed freeware or shareware, this undesired app may have sneak inside too. It may have happened if you have installed a program under Quick/Recommended setup. The problem is that these settings do not openly disclose about third-party apps that may have been included in the software package. Thus, relying on this method, you always risk to let PUPs to get inside your device. To avoid “System Alert! Add Extension” hijack and similar problems, you should always install new software using Advanced/Custom settings. The most important task is to reject installation of “additional downloads” by unmarking pre-selected entries. If you are tired of forced redirects to suspicious websites and want to get rid of fake system alerts for good, you should scan your computer with reputable anti-malware program and perform automatic “System Alert! Add Extension” removal. However, if you have plenty of time or do not want to use additional software, you can opt for the manual elimination method. Thus, you need to investigate the system, look up for unknown programs and browser extensions that may have been recently installed. The instructions below will help you to remove “System Alert! 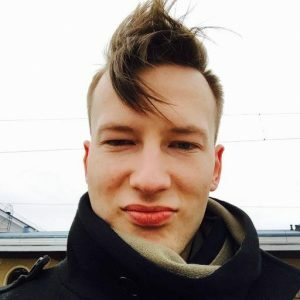 Add Extension” manually. Though, you have to be careful and follow each of the steps carefully. Follow the steps below to find and delete adware program that is responsible for delivering “System Alert! Add Extension.” Make sure that any adware-related entries haven't been left on the system. Then check the list of Chrome's extensions and make sure that any unknown add-ons haven't been installed. Here, look for “System Alert! Add Extension” pop-up or any other recently installed suspicious programs. Wait until you see Applications folder and look for “System Alert! Add Extension” pop-up or any other suspicious programs on it. Now right click on every of such entries and select Move to Trash. When in the new window, check Delete personal settings and select Reset again to complete “System Alert! Add Extension” pop-up removal. Once these steps are finished, “System Alert! Add Extension” pop-up should be removed from your Microsoft Edge browser. Here, select “System Alert! Add Extension” pop-up and other questionable plugins. Click Remove to delete these entries. Now you will see Reset Firefox to its default state message with Reset Firefox button. Click this button for several times and complete “System Alert! Add Extension” pop-up removal. Open Chrome's extensions. Carefully look through the list. If you find some unknown extensions that you do not remember installing, remove them immediately. There's no doubt that they are related to “System Alert! Add Extension” adware. Finally, reset the browser in order to get rid of tracking cookies and other virus-related components. Here, select “System Alert! Add Extension” pop-up and other malicious plugins and select trash icon to delete these entries. Click Reset to confirm this action and complete “System Alert! Add Extension” pop-up removal. Here, select Extensions and look for “System Alert! Add Extension” pop-up or other suspicious entries. Click on the Uninstall button to get rid each of them. Now you will see a detailed dialog window filled with reset options. All of those options are usually checked, but you can specify which of them you want to reset. Click the Reset button to complete “System Alert! Add Extension” pop-up removal process. ^ Jeremy Kirk. Malicious, malware-peddling ad campaigns are becoming trickier to detect. PCWorld. News, tips and reviews on PCs, Windows and more. ^ Novirus. NoVirus. The website about computer viruses and malware removal. This entry was posted on 2017-07-07 at 02:33 and is filed under Adware, Viruses. You can quickly scan the QR code with your mobile device and have “System Alert! Add Extension” pop-up virus manual removal instructions right in your pocket. How did you remove “System Alert! Add Extension” pop-up virus?